If possible, adjust the seat so that when your arms are raised overhead and your hands have grasped onto the bar, your elbows are centered on the elbow pads. Sit and grasp the bar overhead with an overhand grip. Pull the bar downward until it reaches your abdomen (or as far as it will go), exhaling throughout the movement. Allow gravity to slowly move your arms upward to the stretched, overhead position, inhaling throughout the movement. Machine pullovers are similar to dumbbell and barbell pullovers. 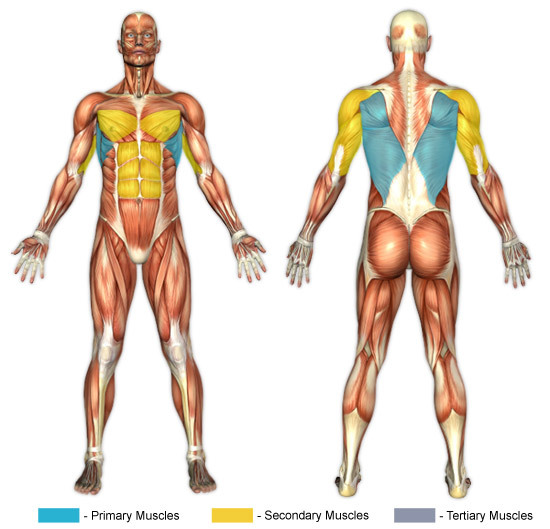 Though not quite as effective in targeting the serratus muscles as dumbbell and barbell pullovers, they are considerably easier to execute, still effective, and safer. They are safer and easier to execute due to the fixed, semi-circular arc that the machine is set to travel through. With dumbbell and barbell pullovers, when in the lowered position (where the arms are parallel to the floor) there is great resistance, but when the weight is over-face (the starting position) there isn't a great deal of resistance. Whereas with machine pullovers, the resistance remains relatively constant throughout the movement, even when the weight is over-face--which is essentially a resting aspect of dumbbell and barbell pullovers. Machine pullovers, like its brethren pullover exercises, does allow for thorax (rib cage) expansion. The expansion occurs during the stretch at the starting position (when the arms are grasping the bar overhead). During the lowered aspect (when the bar is at the abdomen) the abdominal muscles can be squeezed to increase the intensity, and, consequently, get the most out of the exercise.